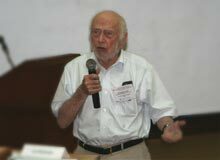 1993 Nobel Memorial Prize in Economics laureate Douglass C. North was the guest speaker at the Ronald Coase Institute and the Philippine Economic Society workshop on institutional analysis on 13 March 2008 at Los Baños, Laguna. Supported by the Friedrich Naumann Foundation (FNF), the aim of the conference was to encourage young academics to apply institutional analysis to a variety of developmental issues and to receive critical input and feedback from some of the most noted academics in the field. These elite coalitions instil order by creating rents or monopolies that are distributed among them to stabilize their base, while the mass of the population has limited or no access to property rights and political power. These limited access societies continue to dominate the modern world. However, a few societies have managed the transition from a system of limited access to one with open, rule-based competition both in the economy and politics. In these countries, often called “western,” people interact on the basis of impersonal rules instead of personal ties.